CBC News, stylized as CBCnews, is the division of the Canadian Broadcasting Corporation responsible for the news gathering and production of news programs on the corporation's English-language operations, namely CBC Television, CBC Radio, CBC News Network, and CBC.ca. Founded in 1941, CBC News is the largest news broadcaster in Canada and has local, regional and national broadcasts and stations. It frequently collaborates with its French-language counterpart, Radio-Canada Info, although the two are organizationally separate. The CBC follows the Journalistic Standards and Practices which provides the policy framework within which CBC journalism seeks to meet the expectations and obligations it faces from the public. The first CBC newscast was a bilingual radio report on November 2, 1936. The CBC News Service was inaugurated during World War II on January 1, 1941 when Dan McArthur, chief news editor, had Wells Ritchie prepare for the announcer Charles Jennings a national report at 8:00 pm. Readers who followed Jennings were Lorne Greene, Frank Herbert and Earl Cameron. CBC News Roundup (French counterpart: La revue de l'actualité) startet on August 16, 1943 at 7:45 pm, being replaced by The World at Six on October 31, 1966. On English-language television the first newscast, part of CBC Newsmagazine, was given on September 8, 1952 on CBLT (Toronto), the only English station then telecasting. Later that year CBC National News was introduced (anchors: Larry Henderson, Earl Cameron, Stanley Burke), then changing its name to The National in 1970. CBC began delivering news online in 1996 via the Newsworld Online website. The CBC News Online site launched in 1998. In 2009, CBC's Television News, Radio News and Digital News departments were merged into CBC News with a central assignment and reporting structure. In 2013, CBC News relaunched its CBC Aboriginal website, based in Winnipeg, with journalists in Toronto and other cities. In 2016, the site was renamed CBC Indigenous. In 2017, CBC News relaunched its flagship newscast, The National, with four co-anchors based in Toronto, Ottawa and Vancouver. CBC News has won Canadian awards including Michener, Gemini, Canadian Screen, Canadian Association of Journalists and RTDNA awards and internationally, Prix Italia, Monte Carlo, Gabriel, Gracie and International Emmys. Thousands of hours of archival CBC News programming are available at the CBC Digital Archives Website and Facebook page. The Television News section of CBC News is responsible for the news programs on CBC Television and CBC News Network, including national news programs like The National, Marketplace, The Fifth Estate, The Investigators with Diana Swain and The Weekly with Wendy Mesley. They are also responsible for news, business, weather and sports information for Air Canada's inflight entertainment. The distinctive music on all CBC television news programs was introduced in 2006 as part of the extensive rebranding of all news programming under the CBC News title. Most local newscasts on CBC Television are currently branded as CBC News: [city/province name], such as CBC News: Toronto at Six. Local radio newscasts are heard on the half-hour during morning and afternoon drive shows and on the hour at other times during the day. The Radio News section of CBC News produces on-the-hour updates for the CBC's national radio newscasts and provides content for regional updates. Major radio programs include World Report, The World at Six, The World This Hour and The World this Weekend. The majority of news and information is aired on CBC Radio One. All newscasts are available on demand online, via apps or via voice-activated virtual assistants. CBC News Online is the CBC's CBC.ca news website. Launched in 1996, it was named one of the most popular news websites in Canada in 2012. The website provides regional, national, and international news coverage, and investigative, politics, business, arts and entertainment, . investigative, politics, business, entertainment, Indigenous, health, science and tech news. An Opinion section was reintroduced in November 2016. Many reports are accompanied by podcasting, audio and video from the CBC's television and radio news services.CBC News content is available on multiple platforms including Facebook, Twitter, Instagram, etc. CBC News Network (formerly CBC Newsworld) is an English-language news channel owned and operated by the CBC. It began broadcasting on July 31, 1989 from several regional studios in Halifax, Toronto, Winnipeg and Calgary. It was revamped and relaunched as the CBC News Network in 2009 as part of a larger renewal of the CBC News division. Current programs include CBC News Now (based in Toronto with Heather Hiscox, Suhana Meharchand, Carole MacNeil, John Northcott, Andrew Nichols (weekdays) and Aarti Pole and Michael Serapio (weekends)), Power & Politics (based in Ottawa with host Vassy Kapelos), and The National with Adrienne Arsenault and , Ian Hanomansing (Toronto), Andrew Chang (Vancouver) and Rosemary Barton (Ottawa). 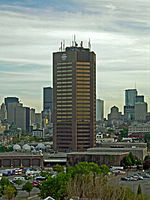 In November 2005, the CBC News Weather Centre was established to cover local and international weather, using in part data provided by Environment Canada. Claire Martin was hired to serve as the primary face of the Weather Centre. In April 2014, the national Weather Centre was effectively disbanded due to CBC budget cuts (Martin had left the CBC a few months prior); weather presenters at local CBC stations were retained but with the added responsibility of supplying reports for The National and CBC News Network. In November 2014, citing difficulties implementing this new system, CBC announced a one-year trial content sharing partnership with The Weather Network, the privately owned cable specialty channel, which went into effect on December 8. Under the partnership, in exchange for access to weather-related news coverage from the CBC, The Weather Network provides the national weather reports seen on The National and CBCNN daytime programming, as well as local forecasts for CBC Toronto's weekend newscasts. Apart from Toronto, weather coverage during local newscasts was not affected, and CBC Vancouver meteorologist Johanna Wagstaffe continues to provide weather coverage for the Vancouver-based (primetime) editions of CBC News Now on CBCNN. The content partnership with the Weather Network has continued beyond the original one-year period, and has been expanded. The weather section of CBC.ca has been phased out in favour of forecasts from The Weather Network, and local CBC news headlines are displayed on the latter's website. CBC News provides the following television programs. Documentary series Doc Zone, The Passionate Eye, CBC Docs POV and The Nature of Things air on CBC News Network but are not produced by CBC News. CBC News provides the following radio programs. Social media including Facebook. Instagram and Snapchat. CBC News Twitter feed has over 2.5M followers. The CBC follows the Journalistic Standards and Practices which provides the policy framework within which CBC journalism seeks to meet the expectations and obligations it faces from the public. The same standards apply to both CBC News and its French language counterpart, Info Radio-Canada. Revised guidelines released in 2018 address contemporary issues such as the ethical use of drones by journalists. Several conservative outlets and politicians have accused the CBC of liberal bias in its news coverage, including the National Post, former prime minister Stephen Harper and columnist Barbara Amiel. In 2009, CBC President Hubert Lacroix commissioned a study to determine whether its news was biased, and if so, to what extent. He said: "Our job — and we take it seriously — is to ensure that the information that we put out is fair and unbiased in everything that we do". The study, the methodology of which was not specified, was due to report results in the fall of 2010. In April 2010, the Conservatives accused pollster Frank Graves of giving partisan advice to the Liberal Party of Canada, noting his donations to the party since 2003. Graves directed a number of public opinion research projects on behalf of the CBC as well as other media organizations, and also appeared on a number of CBC television programs relating to politics. An investigation conducted by the CBC ombudsman found no evidence to support these allegations, stating that personal donor history is not relevant to one's objectivity as a pollster. The CBC itself has denied all allegations of bias, saying that "It is the duty of CBC News to inform its viewers across the country about what is happening, without bias or prejudice, and without telling them what to think. We believe that it is our obligation to report fairly and truthfully." This list section needs additional citations for verification. Please help improve this article by adding citations to reliable sources. Unsourced material may be challenged and removed. The CBC sets out to maintain its accuracy, integrity and fairness in its journalism. As a Canadian institution and a press undertaking, CBC set out the Journalistic Standards and Practices and works in compliance with these principles. Balanced viewpoints must be presented through on-the-air discussions. As it is with other public and private journalistic undertakings, credibility in the eyes of the general population is seen as the corporation's most valuable asset. The CBC Ombudsman is completely independent of CBC program staff and management, reporting directly to the President of the CBC and, through the President, to the Corporation's board of directors. CBC has reporters stationed in the following cities. Main cities are listed with the notation (M). CBC also uses satellite bureaus, with reporters who fly in when a story occurs outside the bureaus. In the late 1990s, the CBC and other media outlets cut back their overseas operations. In 2000, CBC and Power Broadcasting sold these channels to Barry Diller's USA Networks. Diller's company was later acquired by Vivendi Universal, which in turn was partially acquired by NBC to form NBC Universal. NBC Universal still owns the Trio brand, which no longer has any association with the CBC (and, as of the end of 2005, became an Internet-only broadband channel). However, the CBC continued to program NWI, with much of its programming simulcast on the domestic Newsworld service. In late 2004, as a result of a further change in NWI's ownership to the INdTV consortium (including Joel Hyatt and former Vice-President of the United States Al Gore), NWI ceased airing CBC programming on August 1, 2005, when it was renamed Current TV. It was sold to the Al Jazeera Media Network in 2013 and became Al Jazeera America. On September 11, 2001, several American broadcasters without their own news operations, including C-SPAN, carried the CBC's coverage of the September 11, 2001 attacks in New York City and Washington, D.C.. In the days after September 11, C-SPAN carried CBC's nightly newscast, The National, anchored by Peter Mansbridge. The quality of this coverage was recognized specifically by the Canadian Journalism Foundation; editor-in-chief Tony Burman later accepted the Excellence in Journalism Award (2004) – for "rigorous professional practice, accuracy, originality and public accountability" – on behalf of the service. U.S. presidential elections: In 2004, C-SPAN picked up The National the day after the election for the view from Canadians. In 2008, C-SPAN carried the CBC's coverage of the election. Barack Obama inauguration in 2009. With the launch of Sirius Canada in December 2005, some of the CBC's radio networks (including CBC Radio One, Radio Canada International, and Sirius-exclusives Radio Three and Bande à part channels) are available to Sirius subscribers in the United States. A joint investigation between CBC and the Australian Broadcasting Corporation revealed questionable sales tactics employed by the travel company the Global Work & Travel Co. CBC and ABC interviewed former salespersons who were quoted as saying they "felt like [they were] tricking people." ^ "Newsworld Online delivers breaking news". Canadian Broadcasting Corporation. Retrieved 2018-07-24. ^ "CBC News Online launches". Canadian Broadcasting Corporation. Retrieved 2018-07-24. ^ "CBC News Announces 'CBC News: Weather Centre'". Retrieved March 23, 2018. ^ a b Houpt, Simon (November 10, 2014). "Its outlook stormy, CBC turns to the Weather Network". The Globe and Mail. Retrieved December 30, 2014. ^ "CBC Weather - Toronto". Canadian Broadcasting Corporation. Retrieved March 13, 2016. Changes are coming to the weather pages you are visiting at CBCNews.ca. Starting soon, weather pages such as this will no longer be available. Instead, CBC News has partnered with The Weather Network to provide weather information on CBCNews.ca pages. Please visit your local news page to find your local news and weather. ^ a b "CBC to study whether its news is biased". Ottawa Sun. ^ "Complaints about comments made by Frank Graves, President of EKOS Research, about a possible strategy for the Liberal Party" (PDF). CBC Office of the Ombudsman. Archived from the original (PDF) on May 11, 2011. Retrieved October 9, 2010. ^ "Knowlton Nash named inaugural inductee to CBC News Hall of Fame | CBC News". Canadian Broadcasting Corporation. Retrieved 2018-07-24. ^ "Joe Schlesinger latest inductee into CBC News Hall of Fame | CBC News". Canadian Broadcasting Corporation. Retrieved 2018-07-24. ^ "Barbara Frum latest inductee into CBC News Hall of Fame | CBC News". Canadian Broadcasting Corporation. Retrieved 2018-07-24. ^ "Broadcast trailblazer Trina McQueen inducted into CBC News Hall of Fame | CBC News". Canadian Broadcasting Corporation. Retrieved 2018-07-24. ^ "The Office of the Ombudsman". Canadian Broadcasting Corporation. Retrieved April 29, 2012. ^ Natalie Clancy (November 13, 2014). "Global Work & Travel trains salespeople to lie, ex-employees say". This page was last edited on 26 March 2019, at 01:51 (UTC).